Panadura Methodist church is celebrated the 150th anniversary of their old church and the 50th anniversary of the church built when the old church reached 100 years. On this jubilee it is appropriate to write some information regarding this Christian community. 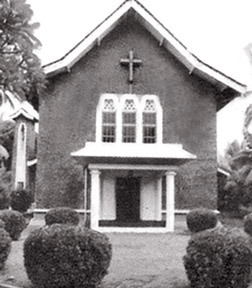 Methodism in Panadura started 194 years ago on June 1, 1817, when Rev. Willium Harward made the first sermon from a way side Ambalama. This Ambalama was a one built by Daniel Rodrigo, a well known philanthropist of Panadura, to be used by the people using the Galle Road. It was later handed over to these missionaries who started a day school and a Bible school there and also used it for worship services on Sundays. With these activities the Methodist congregation increased in Panadura and this Ambalama became inadequate in space. To compensate for this another Church was built in 1822 on an adjoining land donated to the Church by Solomon Rodrigo, a son of Daniel Rodrigo. ‘The Church’ grew so fast so much so that with in three decades that too became not enough. Taking the responsibility the minister-in-charge Rev. Gerard De Silva started a fund to build a Church with 196 pounds. A member of the Church, Andiris Rodrigo also donated a portion of land to build a Church. Rev. John Raymond Paris and Rev. Daniel Henry Perera took forward this good work and started the building project. It was declared open by the then President of Methodist Church Rev. D. J. Grogerly on March 6, 1861. On March 6, 2011 this church celebrated its 150th anniversary. We praise the Lord for all the mercy shown towards us during this long journey. Through dedicated service by the members of this congregation, the Panadura Methodist community grew in numbers. They were responsible citizens of Panadura and made note worthy contributions towards the well being of the citizens of Panadura in general. During the term of Rev. Milton S. Fernando the leaders felt the need for a new church. 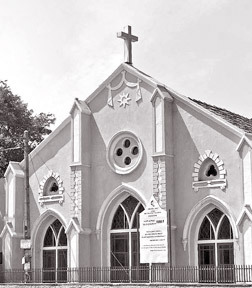 In year 1961 the Panadura Methodist Church was to celebrate the 100th jubilee of their church. Therefore it was decided to build a new church. Alfred Rodrigo and his wife Lily Rodrigo came forward to build this church from their own funds. It was dedicated to the glory of our Lord by Rev. Fred S. de Silva on March 6, 1961. It is this Church that celebrates its’ 50th Anniversary. Christianity is not measured by number of buildings, but by the good deeds. Every Sunday a free medical centre is conducted, which again is serving the poor community. We thank the Lord for the opportunities given to us to serve the people. 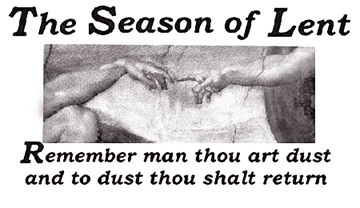 The season of lent begins on the Ash Wednesday which falls on March 09 this year. The Lent is significant for Christians all over the world as a period of prayer and repentence. During this season the Christians perform penances and acts of contrition remembering the agony and the suffering Christ underwent for the salvation of mankind. According to Christian belief, Adam the first man on earth was created by God with soil. On Ash Wednesday at Mass the priest makes a cross on the forehead of devotees saying “You are dust and to dust you will return.” This reminds of death that is inevitable and the importance of virtuous life necessary for everlasting happiness after death. In Sri Lanka the oratorian priests in the Dutch times introduced carrying coconut palms instead of olive branches on the Palm Sunday. Catholics make crosses and preserve them till the Ash Wednesday of the following year where they burn them for ash. The season of Lent lasts for forty days from the Ash Wednesday until the feast of the Resurrection of Christ on the Easter Sunday. Christ before he began his public life spent forty days in prayer, meditation and fasting in preparation of his great ministry. In remembrance of this forty days have been set apart for Lent in the Liturgical calendar. In the past the Catholics strictly followed the season of Lent as a period or penance and repentance. They fasted every Friday and abstained from eating meat on Wednesdays and Fridays in Lent. They avoided weddings, feasts, celebrations and all forms of merrymaking. It was time for prayer meditation and penance.In the evening people in Catholic villages used to get together and recite ‘Pasan, sermons on the sufferings of Christ and plaintive hymns. In the past it was a common sight to hear groups of Catholics singing aloud Pasan at night fall in the Western coastal belt at the Lent in Sri Lanka. ‘Pasan’ in the present form was introduced by Fr Jacome Gonsalvez. Pasan or lamntations on the agonies of Christ was composed in the laudable language of the Prasthi Kavyas or eugolostic poems set to carnatic ragas and folk music. The sermons were taken from ‘Dukprapthi Sangraya also written by Fr Jacome Gonsalvez. Along with pasan and sermons prayers like ‘Kayduskara Prarthanava’ and ‘Maluyane Yagnawa’ were recited on plaintive tones on the chanting style of Sinhala prose were recited. These sermons, Pasan and Palintive chants helped to create a penitential atmosphere for the season. During the Holy Week the able men in the village participated in the Passion plays. It was Blessed Joseph Vape Who introduced Passion zays to Sri Lanka on the model of religious puppet drama he had witnessed in Goa. It is on record in the ‘Oratorian Mission’ that there were passion plays in Kandy and Vanni at the season of Lent in 1706 and later in Trincomalee and several other places. Fr Jacome Gonsalvez improved on these passion plays. He composed plaintive sermons to be recited while the dumb show was on. To break the tedium of listening sermons he composes ‘Pasan’ or lamentations. When he was residing in Bolawatta these passion shows were performed with all the solemnity. Later human actors too participated along with statues in these passion plays. These Passion shows were shown in church premises and all in the village constructed for their success. The times have changed. Today the Lenten rules are relaxed and Catholics are bound to fast only on the Ash Wednesday and the Good Friday. Lenten traditions like detachment and self denial are not observed. Many extravagant celebrations and feasts do take place during the season. This is because today more emphasis is laid on authentic Christian living that the self-imposed penances. The chanting of pasan, sermons and plaintive hymns are rarely found today. It is in very few places that people get together and perform traditional passion plays. In many churches today they have three hours of agony of Christ to fulfil the obligation. On the other hand sophisticated drama on the life and passion of Christ are enacted in various places with entertainment, profit and other aims and objectives in view. There is a school of thought that include some clergy who advocate that the enactment of Passion plays and Three Hours of Agony on the Cross should be abandoned. They submit that the Passion shows served some purpose in the past but they are an anachronism to the enlightened Catholics in the modern age. Imbibed with modern Western thought they say the passion shows are a useless exercise based on emotion found only in Sri Lanka. They argue that instead the life of Christ should be inculcate to people in other ways so as to appeal to the intellect. It should be emphasised that traditional passion shows have been enacted for several centuries for the instruction and edification of the faithful and they have stood the test of time. Even today when the death of Christ is enacted with statues on Good Friday it move the people to the depths of their souls with devotion. If Passion shows were damned as a useless emotional exercise there are so many other Catholic traditions and practices that have to be censured. For instance Christmas celebrated on a grand scale on December 25 is not the actual date of the birth of Christ. In fact Christmas was not there among the earliest festivals of the Church. In Palestine the shepherds watched their flock by day and night from April to November in the dry season. December 25, which fell on the rainy season could hardly be the birthday of Christ. It is said that Christ was born somewhere around August. In the 4th century when the Roman Empire embraced Christianity, the Roman Emperor, Constantine the Great decreed that the birth of Christ should be celebrated on December 25 on the day of the Roman feast of the sun. Later on 354 A.D. Pope Liberanious confirm that the birth of Christ or the Christmas should be celebrated on December 25. As such Christmas is celebrated with so much revelry and pageantry as in the feasts of the Roman feast of the Sun and the Greek festival Saturnila in contrast to the humble birth of Christ in a cattleshed. So Christmas has no connection to the birth of Christ! Besides we also could hear of bleeding from wooden statues and reflections of statues on walls which are temporary phenomenon and the Catholics flock in thousands for those places. There are also healing services based on hypnotism and similar devices. Some time back Catholics flocked to the healing services to Kudagama but the place is now deserted. In contrast with these fraudulent outbursts Passion shows are a harmless spiritual exercise. By abandoning the traditional passion plays, we make more room for sophisticated drama and commercialisation on the life and passion of Christ. Since of late an effort is made by the Catholic Church in Sri Lanka to revive the Lenten traditions and practices like pasan, sermons and plaintive hymns. More attention is also paid on penance, meditation and the Way of the Cross. Extravagant celebrations and feasts discouraged during the Lent. We hope that these endavours of the Church to enliven the season of Lent and bring forth its significance would meet with success. The season of Lenten Pilgrimage to Hiniduma Calvary shrine began with special religious services and flag hoisting at Mount Calvary and Parish Church (St. Anne’s Church) on March 6 at 8 am. The season will be concluded with Thanks Giving Mass on May 1 at 8 am. All arrangements have been made by the administrator of the Parish Church Rev Fr Shelton Fernando to celebrate the pilgrimage season on a grand scale. Pilgrims from various parts of the country flock here to meditate the events and values of the life of Christ and to participate in the Liturgical services during the season. Special religious services are to be held at Mount Calvary (Kurusa Kanda) and Parish Church during the season of LENT. Every week from Mondays to Wednesdays Holy Mass is conducted at 7 am. Various Liturgical services are held from Thursdays to Saturdays from 6 am to 9 pm. Sunday’s Holy Mass will be conducted from 6 am to 12 noon. All facilities such as water, electricity, sanitary, first aid and rest room facilities are available for pilgrims during the LENT season. Pilgrims rests at the premises of Parish Church are provided rest room facilities for 5,000 devotees. Bro John Gilbert OMI celebrated his 60th anniversary of Religious Profession on February 17, 2011. 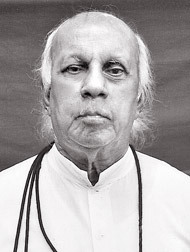 Bro Gilbert was born on April 26, 1932 at Kotahena, and received his education at St. Lucia’s School, Kotahena, St. Mary’s School, Mabole and St. Anthony’s College, Wattala. Being the only child in the family, he could have opted to live on the lap of Luxury. But instead, he responded to the call of the Master, and joined the Congregation of the Oblates of Mary Immaculate. It was late Rev. Fr. Stanley Fernandopulle OMI who helped and fostered his Vocation. Young Gilbert started his Postulancy in April 1949 at the Scholasticate, Borella, and later at Bambalapitiya. On September 7, 1949, he entered the Novitiate at Mont Eden, Kalutara. His first Profession as an Oblate of Mary Immaculate was on February 17 1951. From then on, he served in many capacities – at Archbishop’s House, Borella, Schoalsticate, Nugegoda, and at St. Vincent’s Home, Maggona as Asst. Sacristan, Asst. Children’s Home and as Asst. of the Press. He was also the Director of St. Vincent’s Home Press and from 1969 to 1980, Director, Children’s Home. In 1980, Bro. Gilbert represented the Brothers of Asia-Oceania at the General Chapter in Rome, and in 1985, he represented the Oblate Brothers at the Brothers’ inaugural International meeting in Rome. He was the Treasurer of the Oblate Scholasticate, Ampitiya from 1993 to 2000. Bro. Gilbert and Maggona are inseparable. He was the first Oblate Brother to be appointed Acting Superior and Manager of St. Vincent’s Home, Maggona. St. Vincent’s Home is indebted to Bro. Gilbert, for his commitment, dedication and involvement in all sections of the House at different intervals. He started the Old Boys’ Association of the children’s Home in 1957, and from 1985-1993, he was the Patron of the Death Aid Society of St. Vincent’s Home. From 1987 to 2011, - a period of 24 years – he was put in charge of the Pre-School. Bro Gilbert has set an exemplary record, for posterity to emulate. On April 26, 2006 Bro. Gilbert was appointed Superior of De Mazenod House and Colombo North District with special Indult from Rome. Needless to say, Bro. Gilbert’s achievements and accomplishments should go into the Guinness Book of Records. In a few months, Bro. Gilbert will settle down at Maggona on self-imposed retirement. He will jostle and nestle there, till he is called by the Lord for his reward. Well done Bro. Gilbert, you have been a Beacon to the Oblates young and old alike. We know that you heart is in Maggona. So, box on, dear Brother and thank you for everything you have been to all of us. The Congregation of the Oblates of Mary Immaculate South Province (Colombo) has elected Very Rev Fr Jude Rohan Silva OMI, Director Centre for Society and Religion (CSR) as their 13th Provincial and election has been ratified by the OMI Headquarters in Rome. He replaces Very Rev Fr Clement Waidayasekera OMI who has been elected. Asian Councillor of the OMI Congregation replacing Very Rev Fr Oswald Firth OMI, one time Provincial of the Colombo Province and a lecturer at the National Seminary of Our Lady of Sri Lanka. The Provincial elect is a Post Graduate Degree holder from Luvain University, Belgium on Sociology and Holy Scripture and well experience missionary who had served both local and International churches. The installation ceremony of the New Provincial Very Rev Fr Rohan Silva OMI and the Council Members took place at 9 am on February 17th at the OMI Headquarters at De Mazenod House, Farm Road, Mattakkuliya. We know the truth? Do we know the heart of human kind? Judge not, you will never know it hidden in the depth of human mind. How? Oh how would ye know that this woman sinned? Mind your task with diligence and do it well to satisfy both you and Me. Mona Lisa, Last Supper, works galore, Moon, Mars, searched with fine tune Invention? Discovery? Voyage seeking that Lost Chord; Illusive Truth! More we know of a subject, we know how little we know of it! Can the creature in his puny mind, analyze the Mind of Him who created it? Why spend much time wasted, because you could not find all of it? Live Life, serving all on this voyage of truth, and do your own little bit. Remember Augustine searching for truth walking the beach? Saw a child emptying the ocean into a hole with a shell on that beach. Thought he; I am trying to decipher Truth; that same impossible task? Emptied restlessness-accepting Truth continued to walk that Saintly Path. Truth eludes us, try as we may, to grasp it with Mind Body and Soul. Truth Illusive! We only opine; as this is a view held as probable! Live so, to grasp the splendor of that Truth Most Admirable!